ABS Ireland based in Castletownroche, Co. Cork have kindly agreed to sponsor Paul Trapp, a sire analyst and a distinguished judge from Winsconsin in the USA. Ervin McKinstry, General Manager with ABS Ireland said they were delighted to support Emerald Expo 2013 and to sponsor judge Trapp. Mr. Trapp is a Regional Sire Analyst with ABS Global. Some of his favorite acquisitions to ABS include: Dundee, Destry, Garrett, Gerard, Levi, Gillespy and Gavin. He has a B. Sc Degree (Agri Economics) from the University of Minnesota. Paul and his wife, Sarah own an elite group of Registered Brown Swiss, Jerseys and Holsteins receiving All-American nominations across all three breeds. Mr. Trapp has served five years on World Dairy Expo’s Dairy Cattle Show Committee and was a member of the Young Dairy Leaders Institute’s inaugural class. He has judged shows in 15 different US states at local, state and national levels including the Midwest Spring, Midwest Fall, Mideast Spring and Southern Spring National Holstein Shows. At World Dairy Expo, Paul served as the 2010 Associate Guernsey Judge, was the lead judge for the 2011 International Milking Shorthorn Show and this autumn Paul will be the lead judge for the International Ayrshire Show. In 2010, he was the confirmation judge at the Royal Winter Fair’s Canadian 4-H Classic Junior Dairy Show. He has also traveled to International Dairy Week in Australia many times to judge. In addition, he has judged shows in Brazil, Canada, Puerto Rico, Japan and Britain. 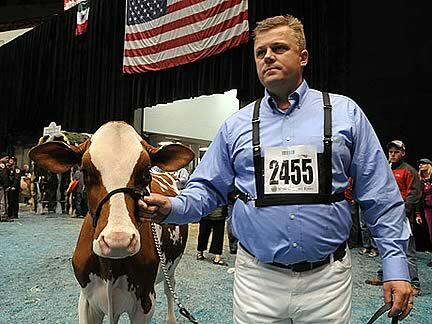 Paul Trapp has served on All-American panels and judged national shows for all seven dairy breeds. He’s also a partner in Pit-Crew Genetics which has received 14 Brown Swiss All-American Nominations in the past several years. Paul is from Taylor in Wisconsin known as "America's Dairyland" as it produces 40% of the cheese and 20% of the butter in the USA. The date has been moved to Saturday, April 27th so as to facilitate dairy farmers, sponsors and trade exhibitors. April is an ideal month as most cows have calved, are out on grass and silage harvesting is not in progress. Milk producers will now have more time to attend, network with other farmers and enjoy a well deserved weekend break in the Marble City. Significant supporters every year include the Dept. of Agriculture and Food, Glanbia and other Agribusiness sponsors such as AIB Bank, Dairymaster, KW Forage Systems, Lakeland Dairies, Pfizer Animal Health and Volac Ireland. Other sponsors include Alta/Bova, Animax, Dovea Genetics, Eurogene/LIC and Progressive Genetics/Semex.